On the 15th of April at Madinat Jumeirah, I was awarded at the Gr8! 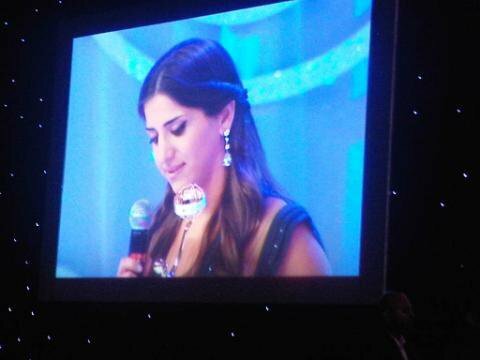 Women Awards first edition in the UAE for my Fashion achievements. This ceremony, brought to us by Petrochem, celebrates women, their beauty and strength and promotes breast-cancer awareness. From India in general, some of the awarded women were Aishwarya Rai, Preity Zinta, and Zeenat Aman. From the UAE besides myself, some truly amazing ladies were awarded such as Lara Satrakian, Nayla Al Khaja and Sarah Belhassa were recognized for their work. In fact, most of the winners were ladies who made a difference to the world by being more like philanthropists. This is where I felt speechless. Here I was, not exactly Alexander Mc Queen and have not publicly taken children off the streets and I was being awarded. From one side, I felt great for being recognized for my efforts and from the other side I thought, maybe its time to make a serious positive difference to this world. And it takes two to tango. I’ve always had a dilemma on whether being considered a celebrity would mean that I’m exploiting a cause I publicly support, or if I’d promote it better. When it came to the speech (yes we had to make a speech that I wasn’t prepared for), with some serious help, I came up with a simple yet witty speech that made people laugh. I thanked the organizers for the award, congratulated my fellow winners and shared a quote by Nancy Reagan: A woman is like a teabag. It’s only when she’s in hot water that you realize how strong she is. My designs are inspired by the woman’s inner beauty to reflect on her outer one. Thank you Petrochem for this beautiful award! This entry was posted in Aiisha, Cause, Charity, DIARY, Dubai, Events and tagged Aishwarya Rai, Breast Cancer, Fashion, Gr8! Women Awards, India, Lara Satrakian, Madinat Jumeirah, Nancy Reagan, Nayla Al Khaja, Petrochem, Preity Zinta, Sarah Belhassa, UAE, Zeenat Aman by Aiisha. Bookmark the permalink.